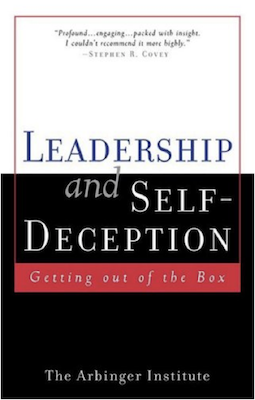 I read Leadership and Self-Deception thanks to a suggestion from Dani, my coach. It’s a quick read, written in the “business parable” style, where a point is made through a story – in this case, an engaging but somewhat cheesy story. In Leadership and Self-Deception, the main character spends a couple of days at his new job learning about, you guessed it, leadership and self-deception. The main point this book makes is that people around us respond primarily to how we’re feeling towards them. If we feel closed or resentful towards someone, no amount of “people skills” or “management techniques” is going to prevent that person from picking up on it. This applies everywhere in life. In a work environment, in particular, how we see and relate to others has a big impact on how effective we can be as leaders. If we aren’t willing to see others in their full complex humanity, we won’t be able to accomplish our best work together. Another interesting point the book makes is that we often get into this closed state (the book calls it being “in the box” towards someone) because of self-betrayal: we fail to do for another person something we thought we should do, and in order to avoid feeling bad about it, we start making stories about how it is actually the other person’s fault, hardening ourselves against them. I read the book a couple of months back and I keep coming back to my notes from it. I suspect I’ll keep coming back to these ideas again and again.